American Gods is one of the most celebrated books in recent memory. With a hit TV series on Starz, Dark Horse made every fan’s dream come true when they announced they would be adapting the book into a comic book series. With volume 1, we get the entire first mini-series, which takes us into a world of old gods, new gods, and a Shadow that looms in the background. 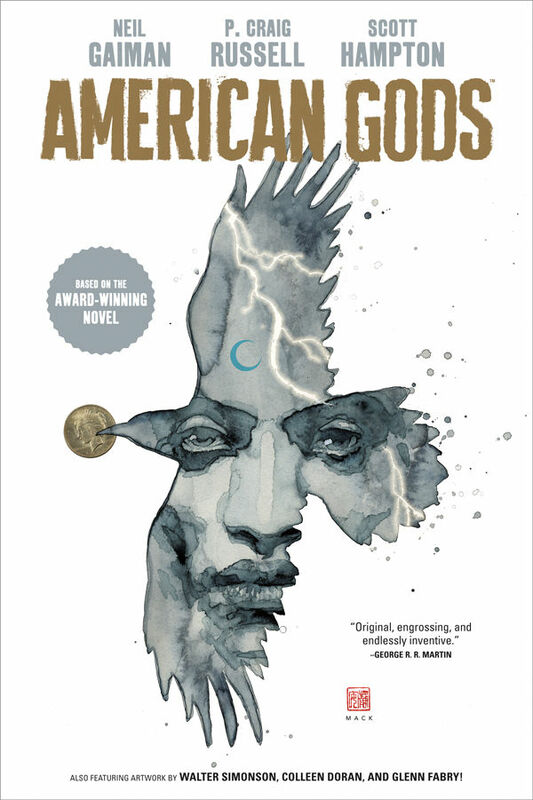 Written by Neil Gaiman and P. Craig Russel with art by Scott Hampton, P. Craig Russel, Walt Simonson, Collen Doran, Glenn Fabry and a beautiful cover by David Mack, this collection is a must for fans of American Gods. With those not familiar with the book, it follows Shadow, a convict who gets an early release upon learning of the untimely death of his wife, Laura. As fate would have it, he crosses path with the mysterious Mr. Wednesday, who offers him a job but also brings Shadow into a world full of myths, Gods, and revelations. With this collection, we see Shadow’s encounter with the crazed Mad Sweeny, as well as other old gods from times forgotten, as well as new gods based on our very real reality. This is such a faithful adaptation of the book. Seeing the story brought to life so vividly, with panels so well timed and dialogue that fits so well, it is a perfect jumping on point for those who might be unfamiliar with American Gods lore. Gaiman, Russel and the crew create one of the best mini-series in a long time, and with this hardcover collection, you can get caught up for the second mini-series- My Ainsel. American Gods: Shadows is not only worthy of its name, it is a shining example of a true to page adaptation.